st leonards follies: They say that dogs do not have souls! photograph from the chimney taken in 1989 yes he did eat the chair back !!!! 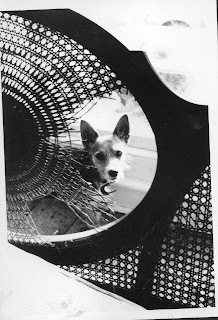 For 17 years Rex was my loyal companion , a typical Jack Russel . He came every where with me, we were "an item. " I bought him unseen as a 5 month puppy. I know it was a risk. The previous owners had split up and a puppy was too much for either party to handle. He arrived in style in a taxi from Eastbourne secured in a cat basket. It was love at first sight even my cats loved him. From that moment he was my protector , guarding me with a passion that could at times be rather trying to my friends. He herded my friends, which meant throwing himself at the door if anyone wanted to leave and the word "goodbye" provoked anguished barking. Maybe he remembered being rejected by his previous owners. Often I would be chatting away to a stranger on a train journey and he would angelically be sat on my lap listening intently . I would always warn people not to say "goodbye" on leaving however of course they forgot and he would throw himself at the window barking furiously as they left. The look of complete astonishment as they walked along the platform only added to my embarrassment. Rex was a character. His adventures were mind boggling to the extreme . He once held up the train at Warrior Square by walking on the line . He had escaped by the cat flap and raced to the train station expecting me to descend from the train as usual. Apparently when he saw the train leave without me , he followed it through the tunnel . The ticket collector recognised Rex and I was contacted . We expected the worse , however miraculously he was rescued , survived and appeared in the local news paper. Another time he escaped from the house and the dog sitter whilst I was in London and raced to my shop in Norman Road, where he expected to find me, only to find the shop closed. Witnesses saw a young girl pick him ...he was stolen . He disappeared for a month. We advertised , in the newspaper and the radio and every vet had been contacted . No one knows exactly what happened but obviously he managed to escape as a month later a builder found him limping badly at the top of my road desperately trying to make it to the house . He had been run over and badly hurt. The builder took him to the vet . It was the vet who contacted me . Again he survived . The joy of being reunited will stay with me for ever . The cat flap was sealed up and Rex never left my side. 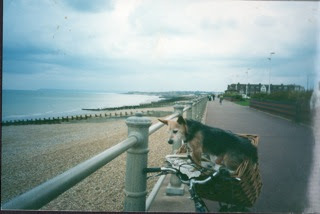 Our walks along the seafront sometimes as far as Pevensey and back (over ten miles )were perhaps the most memorable .Then one day, many years later , Rex refused to leave the flat where we now lived. He no longer jumped up excitedly at the sight of the lead . He suddenly became an elderly dog, the fur turned grey, the alert eyes dulled and I knew that time was running out. Rex died aged 17 1/2 in my arms and I wept buckets. I thought that he had left me for ever . I never replaced Rex with another dog, he was irreplaceable. However I talk to all the dogs in the area and a little bit of Rex joins me as memories subliminally flash like a Victorian flicker bookof our times together. It must have been a year later. It was late Spring. I was sitting in the large sitting room that looks out to the park. It was late evening ,the windows were rattling with the howling gale that was causing havoc outside . I heard a crash and to my horror I saw my temporary plastic greenhouse taking off on the patio . The seedlings that I had cherished with such care from the propagator were scattered on the ground. It must have been at least twenty trays. I raced out dressed in a flimsy nightgown and tried to rescue as many trays as I could . It was an impossible task but I managed to salvage a few . The gale was tearing at my nightgown and the torrential rain running like a waterfall through my drenched body , my long hair streaked across my face blinding me making it completely impossible to continue especially as I live right on the seafront. If anyone saw me they would have just thought that I was completely mad. In the end I just gave up . I sat on the sofa and wept feeling really sorry for myself , a rather pathetic wreck . It is at times like this that I feel particularly alone . I heard a fluttering in the fireplace. I refused to look . It was the last thing I needed a baby seagull falling down the chimney . I've rescued a seagull( I will blog on it soon ). its hard work and they can be very vicious when you pick them up . It kept on fluttering as I sobbed with self pity. Eventually I could stand it no more and my eyes settled on the fire place ...but it wasn't a seagull...it was a piece of paper fluttering up and down in an extraordinary manner . I walked over to the fire place to remove it . The noise was getting on my nerves . I picked it up and to my surprise it was a photograph of Rex,one of my favourite photographs, hardly damaged slightly covered in soot. It had disappeared from the mantlepiece months ago . Obviously it had fallen to the ground and the drawer of the chimney had sucked it up where it stayed lodged in the chimney breast for many months .The gale that night had dislodged it . There he was at my side comforting me and telling me to pull myself together... OK folks think me mad but from that moment I felt better , strong capable and ready to fight and experience another day. I've never been able to work out why it was never burnt as I do use my fireplace but of course many a treasure has been found in chimneys even babies shoes completely unscathed. I still have the photograph and will of course treasure it .